I hope I don’t scare you too much with this information but I don’t spend too much time planning our Pin God 1st reading plan. I have the calendar for the year mapped out through prayer and unless I get clear direction to move or shift I stick with it. This month I was told to move. So Philippians here we are. How is it treating you? I also look for natural breaks in the text as I plan our daily reading so that I don’t over analyze. I want to have fresh eyes when I read it with you. But, on February 1st I looked at it and then I REALLY looked at it! I have two little people who are 4 and 5 and we most certainly do not do EVERYTHING without complaining or arguing…mama included. So it seemed like a prefect verse to add some life application to. 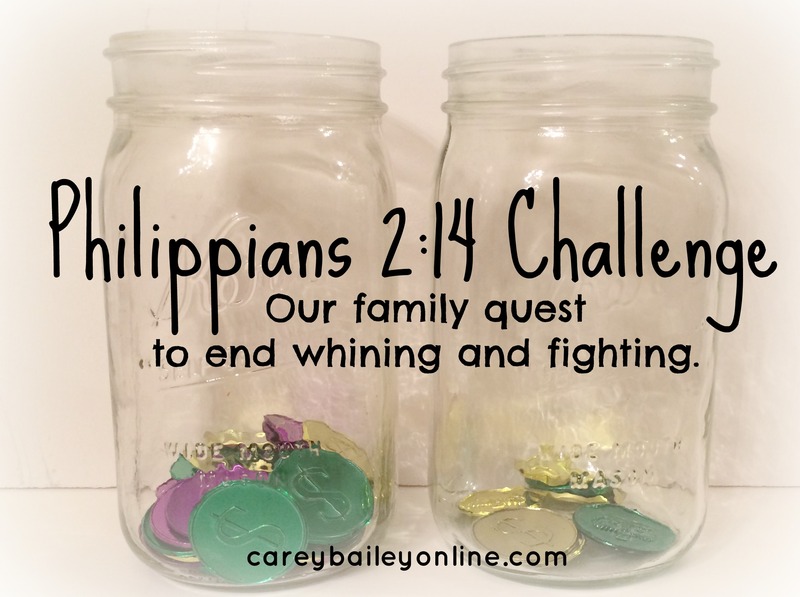 After talking with my husband we decided to issue a family Philippians 2:14 Challenge. Here is how it works. It simply involves two jars. At the start of the day one is filled with 40 (good biblical number, right?) plastic coins and if ANYONE whines or argues then a coin gets moved to the other jar. If we end the day with 25 coins left then we get a family check mark and if we get thirty check marks we get a family prize. Doesn’t have to be huge…can be a family trip to grab ice cream or maybe go BIG…your call. I do recommend the kids know what their goal is and even have input in the reward. Can I just say how good this has been for all of us?! 1. We sat down and talked about what equaled complaining and arguing. 2. We talked about ideas of things we can do if we think we are about to complain or argue. The kids thought of things like catch a bubble in your mouth, give hugs, and put yourself in time out (my daughter has done this multiple times and fallen asleep). My son who is a major rule follower tells on himself and moves his own coins but also keeps us all accountable. Saying things like “Mom, don’t do it…catch that bubble!” Since whining typically equals me raising my tone of voice we decided that we also lose family coins if anger rather than patience comes out. Hello, accountability for patience???? So if you are looking for a way to curb the complaining and arguing in your home or self here you go. 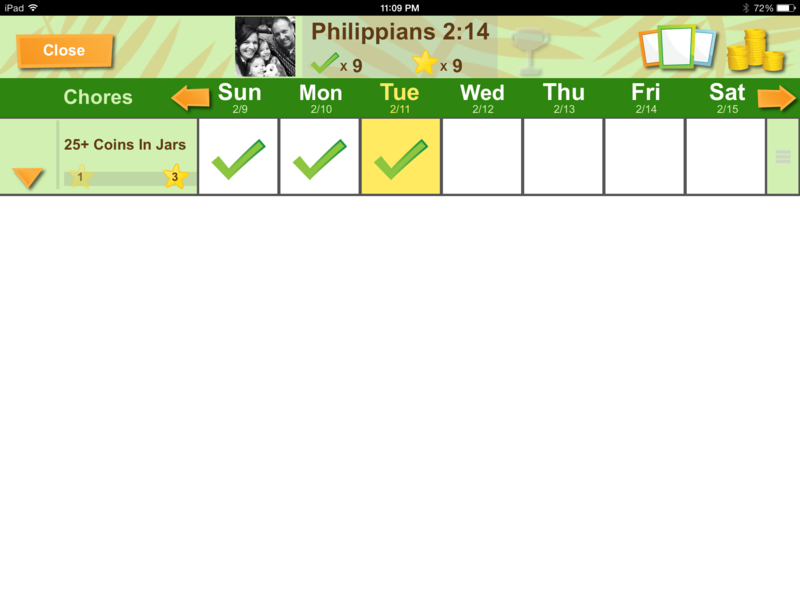 Issue your own Philippians 2:14 Challenge. We have 9 check marks so far. Only 21 more to go! I am truly praying that this truth penetrates our family and we can at least be a family who does not complain or argue in everything we do…or I can at least cross my finger for in most everything we do. Less than a month before I head out with 7 other bloggers to tell the story of Soul Hope. I would love your partnership as I still have plenty of funds left to raise for the journey. You can give through You Caring.